Zonta Club of Fort Myers is participating in “Zonta says NO,” a campaign designed by Zonta International to raise awareness and help bring an end to violence against women and girls across the globe. 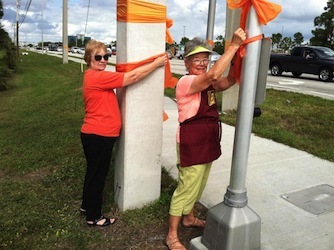 Together with other Zonta groups in District 11, the Zonta Club of Fort Myers will be putting up orange ribbons on power poles and streetlights along US 41 to raise awareness and incite discussion about this important issue. On Monday, November 25, 2013, from 7 a.m. to 9 a.m., members of the Zonta Club of Fort Myers will be on the corner of Cypress Lake and 41 where they will be on hand to give more information. Becky Wiehe and Marietta Meacham from Zonta Club of Fort Myers hang orange ribbons to raise awareness about violence against women. The Zonta Says NO campaign began in November 2012 and will continue through December 2013. Zonta clubs across the world are activating the community through awareness campaigns such as the orange ribbons. In conjunction, Zonta clubs will also hold advocacy events to help raise awareness and inspire others to work toward ending violence against women worldwide. “Our club is working with other clubs in our district so that we can make the biggest impact possible. This is a vital issue that affects women right in our own town. Our hope is that these orange ribbons will get people talking and taking action,” says Martha Nagata of Zonta Club of Fort Myers. Orange is the color chosen by the UN to designate issues regarding violence against women. By placing these bright orange ribbons in visible areas along US 41, Zontians are hoping to draw public attention to an important global issue. This project is part of Zonta International’s “16 days of activism,” a global campaign where Zonta’s membership demonstrates solidarity in raising awareness about gender-based violence as a human rights issue on local, national, regional, and international levels. The Zonta Club of Fort Myers is a local chapter of Zonta International, a global service organization of executives and professionals working together to advance the status of women worldwide through service and advocacy. Zonta is the only international service organization focused on advancing the political, economic, social and educational status of women worldwide. Zontians work throughout the world to address the needs of women at all socio-economic levels. These needs include basic health, education, welfare and human rights.